Easynews has been in business for over 15 years and offers a very sophisticated, yet easy to use web based Usenet reader. Search, preview and download from anywhere you have internet with the Easynews browser. Rather than having a fully unlimited data bandwidth packages come in "data blocks". However you do get unlimited data with the BIG GIG PLAN. All other plans are up-gradable to unlimited for a small fee. 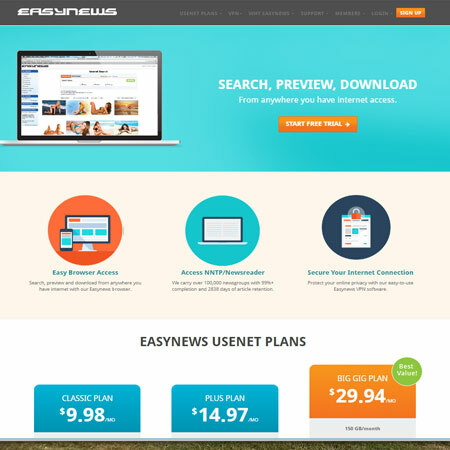 Easynews offers a FREE trial of their services. Please be sure to check the terms and conditions of any trials.